It is named for Jerry Mortensen, who designed the program after working for years in Montessori schools. The blocks are an adjunct to the method. 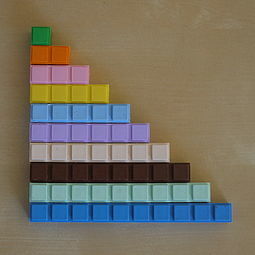 This is a unique approach to teaching Mathematics that also employs manipulatives. 2. 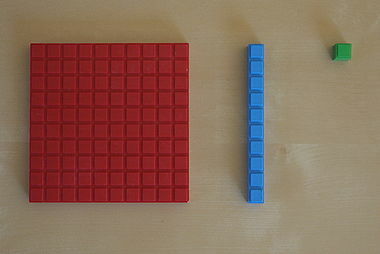 One of the key principles is “to see all numbers as rectangles.” What does this mean? Traditionally when a speaker says “five” the listener has a mental image of the numeral 5. Yet, when a speaker says “Peter!” the listener sees Peters’s face in his mind’s eye. Similarly with other nouns we form a mental image of the object as it is mentioned by name. We do not have a mental image of the name, as in block capital letters, say. We don’t “see” A-P-P-L-L-E in our mind’s eye, we see what that object looks like.A rectangle has area and dimension, two of them, Mortensen calls them the “over” and “up.” Dimensions. 3. All we do in math is count is another key principle. What do we do with numbers? Even the youngest child knows that: we count with them. To count you first must know what one is. See one as a rectangle that is “one over” and “one up”. Now, all operations are just “building rectangles” and therefore all a child needs to know to do all the math there is, is to count to nine and to build a rectangle. As in all skill-learning, knowledge of results is important. When relying on memory to do math in the traditional way, there is no certainty, no way of knowing that you have done it right. With Mortensen Math there is a very good visual check. If the rectangle has no holes in it, and no bits sticking out, then it is correct. The learner can see that it is right. This builds confidence.